Design, structure, and function of the Cornell Center. The structure of the Center is shown in Figure below. The Co-Director’s will co-chair the Executive Committee, composed of the Center’s Core Directors and program manager. Each of the Cores will support the pilot research projects proposed, and the CAB’s will constitute a Project Working Group (PWG) customized to each project. The Executive Committee will meet monthly to track the Center’s progress, and to plan for conferences, symposia, and strategic planning retreats. Decisions will be made as much as possible by consensus, with the majority view obtained by vote if needed. The Center Co-Directors, Core directors, and CAB Chairs will each have one vote. The Center is well-aligned with Cornell’s “One Cornell” objective to enhance collaborations between the two campuses, as shown in the figure above. 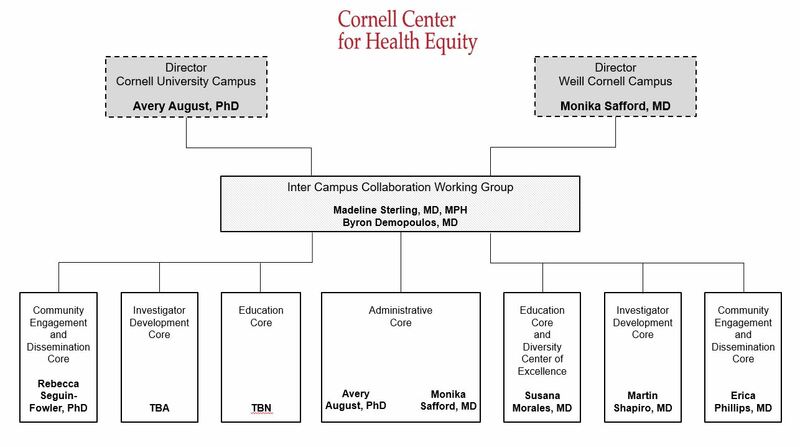 Several institutions within each campus will extend the reach of the Cornell Center for Health Equity, including at WCMC the Clinical and Translational Science Center (CTSC), the Office of Diversity and Student Life, and the Office of Faculty Diversity in Medicine and Science, all of which offer faculty development courses and workshops; and on the Ithaca campus the Office of Faculty Development and Diversity, the Faculty Institute for Diversity, the Center for the Study of Inequality, and the Institute for Health Economics, Health Behaviors and Disparities, all of which offer faculty development and enrichment opportunities. The Cornell Center for Health Equity will integrate into these programs, assuring that the Center’s offerings will not duplicate existing programs.